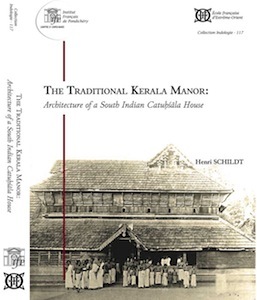 The Traditional Kerala Manor: Architecture of a South Indian Catuhsala House, by Henri Schildt, Collection Indologie n˚117, IFP/EFEO, 2012, xiv, 473 p., including 176 p. of b&w plates. This work describes the feudal late mediaeval high-caste Kerala house. It lays particular emphasis upon the so-called 'four-house' mansion, called catuhsala in Sanskrit and nalukettu in Malayalam, the vernacular of Kerala. This palatial kind of mansion is regarded as ritually ‘complete' and, as such, appropriate - according to local Sanskrit treatises on architecture -, to the feudal clergy, royalty and aristocracy. The work describes the architecture of thirty historic houses of this type, highlighting their relation to Sanskritic architectural theory and to brahminical codes of daily life and ritual. It concludes with an attempt to present an overview of the notion of the architectural and ritual space of these houses as a microcosm.